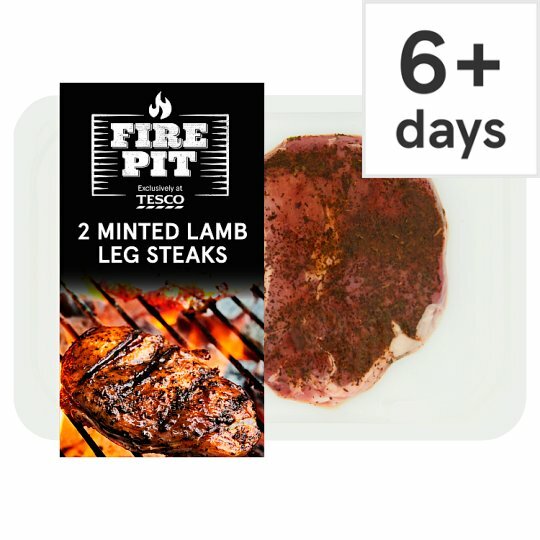 2 Lamb leg steaks with mint seasoning. These rich and aromatic minted lamb leg steaks are great come rain or shine. INGREDIENTS: Lamb (92%), Sugar, Spirit Vinegar Powder, Mint, Maize Starch, Salt, Acidity Regulator (Citric Acid), Yeast Extract, Tomato Powder, Paprika Extract, Parsley, White Pepper, Rapeseed Oil, Turmeric, Spearmint Extract. Keep refrigerated. Once opened, consume within 24 hours and by ‘use by’ date shown. Instructions: Grill 10-14 mins Place steaks under a pre-heated grill for 10-12 minutes (medium) or 12-14 minutes (well done), turning once. Remove from grill and rest on warm plate for 5 minutes. These instructions are given as a guideline only as steak thickness will vary slightly. If you prefer a rare product reduce cooking times accordingly. Vacuum packed for freshness and to improve tenderness and succulence. It is normal for there to be an odour on opening. Once defrosted, use the same day and do not refreeze.